Neil Young News: "I met Neil Young on a Gravel Road in Mayflower Today. Yes Really." Neil Young was driving his LincVolt thru Mayflower, Arkansas the other day looking at the aftermath of the Canadian Tar Sands pipeline rupture and devastation. Shelli Russell just happened to encounter Neil Young. 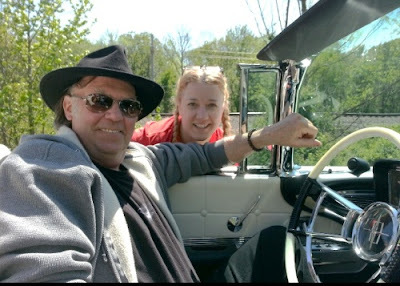 Here's Shelli's story I met Neil Young on a Gravel Road in Mayflower Today. Yes Really. – MySaline.com. Maybe she should stalk him a little more next time???? I think that was really rude. Why didn't she just mind her own business and let him do his thing? Pulling a u-turn, flashing lights, honking horn just because it was a car she had never seen in that area before. When life presents you with an opportunity like that GRAB IT! You rock girl! @DBF: I understand your point, but after meeting Neil she did write about the experience on her blog, exposing the LincVolt project to many people who otherwise wouldn't know about it. That can only be a good thing. Now that is Unbelievable! What a magical day that was for you... Great story ! !Please tell Neil to head towards Eureka Springs, Ar! I was on a plane once with Neil and walked right with him out of the gate. There was no way in H I was going to open my mouth and drivel to him. He hates that stuff. Clearly by the look on his face in the photo he's like, "grin and bear it and get the hell out of here before this girl goes 'Misery' on me. Thank you for the kind words about my story, which I've grown tired of because people tend to focus more on the rocker and less on the reason he was driving about on Earth Day. Please see www.lincvolt.com and study the car and engine Mr. Young and his team have developed. You may want one in your car someday. Clearly you weren't there to know what the look on his face means. Mr. Young was very cordial and in a good mood. After I recognized it was him, it was obvious he was there because of the oil spill. Other notables have visited, btw and it is in fact international news because of our dependency on and love/hate relationship with crude. Following him began from at least 6 car lengths on a 30 mph road and when he passed the correct neighborhood entrance, my aim was to help him find it. At no time did I act like a stalker or crazed fan. I realize that people expect in others what they know to be true about themselves, but it is best not to judge others based on what you believe happened. This is why even highly educated individuals in this country who are elevated to the honorable position title of "judge," they are nevertheless bound to a standard of scrutinizing behavior as "innocent until proven guilty." P.S. I wrote a second story detailing the reason I was there. Exxon is bringing the contaminated dirt to my county's landfill. The Mayflower tragedy is, sadly, another blacked out media story overtaken by some celebrity distraction or other. Feel free to post link. Shelli!! I love your story! Our family has a farm in Conway, not far from your neck of the woods. Thank you for bringing much needed attention to what has happened in our beloved "Natural State". Please, please, don't let the doubters and the negativity cause you to tire of the story. You have a great future ahead of you. LincVolt is truly a labor of love, and you get that. You focused on the message. Your gumption and fearlessness brought attention to a story that, I'm sure, many have not heard about. Transparency works best. Light a candle for the world to see. Surprised to see this story is still here! I've moved my blog to a new version of the website, so I'm checking in to let you know to change the link when you get time. Thanks again for linking to my story of a pretty incredible day!